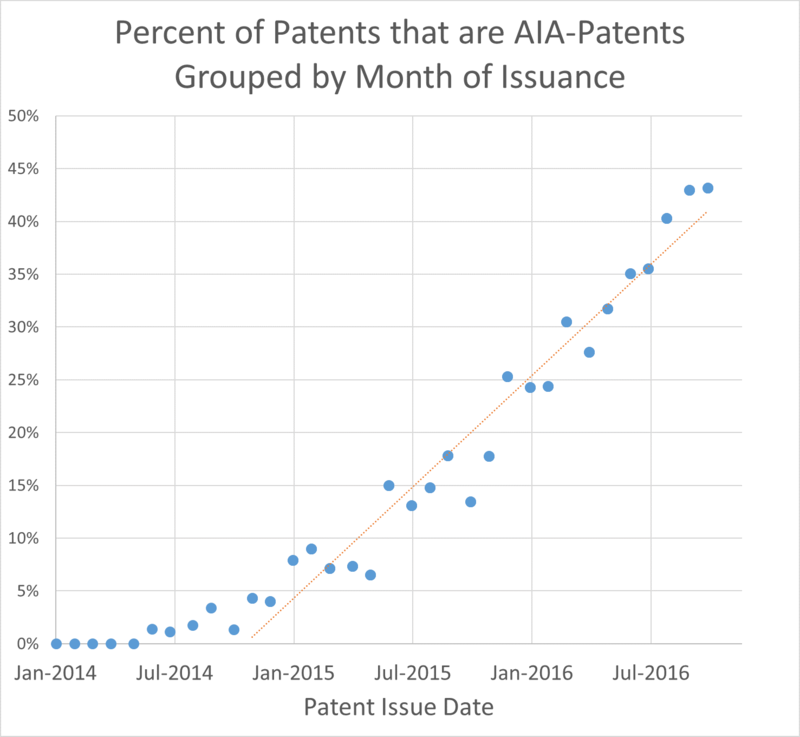 AIA Patents – Approaching 50% of newly issued patents. By the end of the calendar year, most newly issued US utility patents will be considered “AIA Patents.” AIA-patents are examined under the first-to-file rules of the America Invents Act of 2011 and are also subject to potential post-grant-review proceedings. The chart below shows results from a random sample of 7,300 recently issued patents. RMail: Is Eligibility a Proper Litigation Defense? Thus far, the Federal Circuit has successfully ducked any direct holding on whether eligibility under 35 U.S.C. 101 is a “condition of patentability” or a proper invalidity defenes. Professor Hricik and I raised these issues in a number of posts back in 2012.
plain language of §282(b)(2) does not authorize ineligibility as a defense. In the end, I expect that history and tradition are strong enough to overcome the statutory gap, but it would be nice to see an explanation from the Court. Read the brief: RMAIL 101 Challenge. Update: If Alice was always the law, why did you get so many “invalid” patents for your clients? The Dickstein Shapiro firm had been retained by Encyclopaedia Britannica, Inc. (EB) in 1993 to file a patent application. The patent issued, and in 2006 EB sued several companies for infringing it. The patent was held invalid due to “an unnoticed defect” in the 1993 application. The basis for invalidity was not 101, and is not clearly stated in the opinion, but seems to have been a break in the chain for priority. EB then sued the law firm for malpractice in prosecuting the 1993 application. EB contended that, but for the firm’s negligence, it would have made a lot of money in the infringement suit. After the malpractice suit was filed, Alice was decided. The defendant law firm then argued that — had the defendants in the 2006 case not prevailed on the “unnoticed defect” defense (the break in the chain for priority) — they would have prevailed because the patents were “invalid” under 101. Because the claims would have been “invalid” in the 2006 litigation under 101, there was no harm caused by the actual basis for invalidity — the priority problem. To put this in context: Because of a 2014 Supreme Court decision, the 2006 infringement case would have been lost in 2009 anyway because the court in 2009 would have applied Alice’s standard and found the claims ineligible. And the argument worked. The district court granted a motion to dismiss for failure to state a claim (actually, for judgment on the pleadings under 12(c), but same standard), finding (holding?) the subject matter ineligible on the face of the patent. When the Supreme Court construes a federal statute… that construction is an authoritative statement of what the statute has always meant that applies retroactively. Alice represents the Supreme Court’s definitive statement on what 101 means — and always meant. Because the underlying case is governed by 101, it is appropriate for this Court to apply the Supreme Court’s construction of 101 as set forth in Alice. For this and other reasons, the court reasoned that “the only rule that makes sense in this context is to apply the objectively correct legal standard as enunciated by the Supreme Court in Alice, rather than an incorrect legal standard that the [district court in the 2006 infringement case] may have applied prior to July 2015 [when the court was deciding the motion. ]” The court then applied Alice and found the claims “invalid” under 101. Thus, the firm’s failure to maintain priority did not cause harm — the “invalidity” under 101 did. Let’s start with a basic statutory interpretation principle: as a matter of statutory construction the retroactivity principle relied upon by the district court is correct in that retroactivity does not ordinarily apply when an interpretation is changed. (This perhaps explains why the Supreme Court is careful to avoid saying it is changing an interpretation, because changes to interpretations of a statute are prospective, only, as a general rule. In that regard, think about Therasense for a moment.) So, if Alice changed the law, then the district court was likely wrong to apply it retroactively. Let’s be real: the Supreme Court will never say that Alice changed the law. We all know it did, or I guess a better way of putting it is: we were wrong about what the pre-Alice law meant — despite reading the cases as best we could, and so was the USPTO (which is why it issued all those bad patents, and had to put in place, post-Alice, all of those new guidelines, etc.). So, we were all wrong and Alice merely said what we all were not smart enough to understand the law always was and had been. But now let’s look at Dickstein Shapiro’s conduct through that lens: if the law was that clear — that you could 12(b)(6) or summary judgment this patent for “invalidity” under Section 101, why did you get the for the client in the first place? If the law about 101 “always” was this way, why did you advise EB to spend so much money on a patent so clearly invalid that a judge could decide it by looking at it? If cert is not granted, patent prosecutors should be ready to disgorge a lot of fees, I guess is what I’m saying. Remember: fee disgorgment doesn’t require damages — it requires (usually) a clear and serious breach of duty. How can this not be? Now, we can get into what is called judgmental immunity — but if the law was settled and clear, how can that help? We could also argue the law changed — but it didn’t, or so the courts tell us. But we can’t obviously do this: Allow lawyers to escape liability for bad patents because the law was “clear” back then, and so the client would never have prevailed in an infringement suit, but then allow lawyers to say “the law was unclear” and allow them to avoid disgorging fees. Someone got any ideas? The intellectually honest way to approach it is to say that the EB case was wrongly decided: whether the patent would have been “invalid” under 101 in the 2006 litigation should be decided under the law at the time of trial, not the law in 2014, just as the decision to seek the patent in 1993 should turn on 101 law in 1993, not the law in 2014. More to that point, we all know that certain claim formats have fallen out of favor (e.g., means-plus-function). If the law was favorable to them in, say, 1993, and a lawyer picked them, why should we use standards developed in 2014 to judge the lawyer’s conduct, even though the “change” is more subtle than occurred in Alice? And now one more wrinkle. Suppose a firm represents the client, and sues. Suppose the judge shifts fees onto the client under 285. Unless the court holds that those fees are the responsibility of the lawyer bringing the suit, not the client, then the client’ going to be responsible for having sued on an “invalid” patent. Is it going to sue the prosecution firm and say: the law was clear back then, why did you get this patent for me? Look at the damages you caused…? Guest Post from Professors Arti Rai and Colleen Chien. At 1 pm today, USPTO Director Michelle Lee will be testifying before the House Judiciary Committee at a USPTO Oversight Hearing. The hearing will focus on questions of patent quality raised by two recent GAO reports (here and here) as well as the issue of examiner reporting of time raised by a report by the Department of Commerce’s Office of the Inspector General (here). As we have discussed, the two of us are following closely the USPTO’s efforts to address issues of patent quality through its Enhanced Patent Quality Initiative (EPQI) – an urgent but also enduring challenge that one of our nation’s first patent examiners, Thomas Jefferson, struggled with. Our institutions, the Duke Law Center for Innovation Policy and the Santa Clara High Tech Law Institute, are also co-sponsoring two conferences on EPQI and other levers for improving patent quality. On Friday, September 9, we held the first of these conferences at Santa Clara Law School. The conference brought together Deputy Commissioner for Patent Quality Valencia Martin-Wallace, Deputy Commissioner for Patents Andy Faile, former PTO Director David Kappos, EPO Director of Quality Support Alfred Spigarelli, GAO officials, industry representatives, and legal academics. Here we provide a brief summary of the event. Video and links to the presentations and related papers will be available here (a uncut version of the video is here). Several of the commentators will be publishing op-ed versions of their remarks with IPLaw360 from now until the December 13, 2016 conference, and the Berkeley Technology Law Journal has published short commentaries from a number of the speakers on their topics. Valencia Martin-Wallace began by highlighting 6 aspects of the EPQI: case studies the USPTO is implementing in response to stakeholder requests; the Master Review Form (MRF), which is now being used as the exclusive review form by the Office of Patent Quality Assurance; other quality metrics; USPTO study of post-grant outcomes for purposes of improving ex ante patent examination, both in child applications of parents there are the subject of a post-grant review and more generally; a post-prosecution pilot; and a clarity of the record pilot. Martin-Wallace’s comprehensive discussion of the MRF and quality metrics honed in on the difficult question of what quality means and how the PTO should measure it. According to the USPTO, the MRF’s focus on clarity and correctness of the examination is a key aspect of how the agency measures product quality. The agency is also very interested in process quality, by which it means a focus on reducing rework and ensuring consistency. The USPTO will also continue to monitor perceptions of quality through internal and external quality surveys. USPTO Case studies on 101 – the compliance of rejections with 35 U.S.C. 101 Official Guidance and the consistency of the application of 101 across art units/technology centers – will be issued on September 30 and December 9 respectively. They will be followed by case studies on other types of rejections. Martin-Wallace’s presentation was followed by a panel discussion of claim clarity and examination consistency. Peter Menell discussed how claim clarity could be improved through a claim template [link] and the importance of putting all interactions with the examiner into the record. Charles Duan also highlighted the importance of a clear prosecution record, particularly for purposes of allowing courts to find claim scope disavowal. Jay Kesan focused on the lack of standardized claim language in software and suggested mechanisms for improving standardization. Finally, Xavier Jaravel of Stanford presented his research with Josh Feng of Harvard showing that NPEs tend to purchase patents granted by lenient examiners that are incremental and vaguely worded; they estimate that a one-standard deviation change in the “examiner effect” could lower the rate of litigation and NPE purchased patents by 50%. The conference then turned to issue of examiner time allocation, and in particular ensuring adequate time for search. Deputy Commissioner for Patent Operations Andy Faile outlined the count system and the time that examiners are given to achieve each count. On the first round of examination, examiners receive 1.25 counts for the first office action; 0.25 counts for the final rejection in that round; 0.75 counts for an allowance disposal: and 0.5 counts for termination of the first round of examination (“abandonment”). The time allocated to achieve each count is a function of the area of technology – for example, while 16.6 hours are allocated per disposal in fishing lures, examiners are given almost double that, 27.7 hours per satellite communications disposal. It is also a function of GS-level of the examiner – as in the EPO, senior examiners at the USPTO are expected to produce more work than junior examiners. Assistant GAO director Robert Marek next discussed highlights from the agency’s studies of patent quality and prior art search. These studies relied heavily on a survey that produced 2669 USPTO examiner respondents. The survey found that 70% of examiners reported having insufficient time to examine applications; the majority reported wanting more time for prior art search; and the majority also reported encountering vague and indefinite claims. Examiners also reported conducting only limited searches for non-patent literature (NPL). On the issue of search, the GAO recommends that the PTO develop guidance of what constitutes a good prior art search; identify key sources of NPL; monitor search quality; and assess the time examiners need for search. On claim clarity, GAO recommends the PTO consider requiring patent applicants to include term glossaries or claim charts. The morning concluded with a panel discussion of prior art search and time. Colleen Chien discussed the findings of a recently released study that suggests that the EPO is much more likely to cite NPL in its search reports than PTO examiners are to rely upon NPL in their examination, despite that the PTO’s examiners are more likely to receive NPL, through IDS’. The paper argues that that the greater amount of time that EPO examiners spend on search (8-12 hours per app, vs. 4-5 hours at the PTO), contributes to this difference. However, the PTAB, which intensely reviews challenged patents, appears to cite NPL even more than EPO examiners do. Michael Frakes and Melissa Wasserman then summarized their empirical research on 1.4 million utility patent applications initiated after March 2001 and disposed of by July 2012. Their research suggests that tightening of examiner time constraints as they move up GS-levels appears to lead to more grants, less examiner citation of prior art, and fewer time-intensive non-obviousness rejections. Their analysis, which follows examiners as they rise up GS-levels within art units, capitalizes on the essentially random assignment of applications within an art unit and employs an examiner fixed-effect design. Moderator Karen Wong called the After Final Consideration Pilot 2.0 one of the PTO’s best inventions, and Steven Reid and others noted that the Post-Prosecution Pilot (P3) examination was also a valuable option for achieving resolution without the need for a full request for continued examination (RCE). Jay Kesan and Colleen Chien kicked off the afternoon with a discussion of the differences between EPO and USPTO processes (the former bifurcates search and examination, doesn’t allow for continuations (but does tolerate divisionals), and charges higher fees, earlier), perceptions of the two institutions (based on a recent survey of ~650 practitioners), and outcomes. Drawing upon matched pair analysis, Kesan’s research suggests that on average EPO patents have fewer claims, and the claims are longer and have greater pendency. Chien’s paper suggests that the lower EPO allowance rate isn’t driven by a higher rejection rate but more applicant withdrawals. EPO Patent Quality Director Alfred Spigarelli’s presentation was titled: “Patent Quality: Get it Right the First Time.” He emphasized the human resources component of the patent quality equation, from the hiring standards the EPO applies (e.g. examiners must be able to actively work in three languages), to the training each EPO examiner receives, to the low turnover rate. Search is viewed as the cornerstone of the patent examination process, with 60% of time dedicated to search. On the panel that followed (“Once and Done” and Differentiating Between Patents), Laura Sheridan outlined a proposal to increase quality and predictability by introducing greater finality into the patent application process. Under Sheridan’s proposal, examination would terminate after a predetermined maximum number of office actions, and the application would be then adjudicated by a panel. Steven Yelderman discussed the dynamic effects on RCE practice of recent changes to fees as well as mechanisms by which post-grant review could feed information back into initial patent examination. Sandy Swain discussed steps that could be taken by applicants now, without any policy changes, stressing the importance of open communication and clear documentation. Alan Marco presented a study in progress of litigated patents, suggesting that small entities are more likely to litigate and finding that (with the exception of continuations) applicant characteristics are more likely to be predictive of litigation than examination characteristics. Studies have shown that delays in patent examination are detrimental to startup firms. For these firms, long pendency could be considered a sign of poor examination quality. Building on this work, Arti Rai discussed her ongoing research on accelerated examination through the Track 1 program. She finds that the program is in fact disproportionately used by small and micro entities. However, the top filers in the program are large entities, and she is studying whether their applications show signs of poor quality. Josh Makower, an investor, inventor, and entrepreneur in the biotechnology and medical device industry, said that all his startups used TrackOne, underscoring the importance of patents to them. According to Oskar Liivak’s interpretation, 35 USC 115 makes it a felony for a patent applicant to claim more broadly than the actual invention. Brian Love noted that the EPQI had two important gaps – already granted patents and the flexing of the USPTO’s fee-setting authority. He recommended raising maintenance fees to cull low-value, low-quality patents and decreasing PTAB fees. Love’s proposals generated vigorous discussion. Dave Kappos provided the final keynote of the day, noting that patent quality has been a focus for as long as we’ve had a patent commissioner. He noted that many efforts he oversaw during his administration to increase quality – giving examiner 2.5 more hours of time, redesigning the IT system, creating the Edison Scholar program, ensuring Examiner received training from industry experts, and many more. What didn’t work, he noted, was working with the AIPLA to devise a set of quality indicia for applicant filings that all agreed upon and that could be applied to applications. What he would work on, were he still in office, would include Track 3 (some version of deferred examination) and allocation of more time, not across the board, but as appropriate. How will we know if the EPQI has been successful in two years? When this question was posed to them, closing panelists Faile, Martin-Wallace, and PTO Silicon Valley Director John Cabeca mentioned a few milestones: greater transparency and engagement of all members of the patent community, creative rethinking of the count system, more time for certain applications, and the leveraging of state of the art examination processes and resources. Arti Rai is the Elvin R. Latty Professor of Law at Duke Law School and co-Director, Duke Law Center for Innovation Policy. Colleen Chien is Associate Professor of Law at Santa Clara University School of Law. Stryker prevailed in a patent infringement suit against Zimmer, obtaining partial summary judgment of infringement as to some claims, a jury verdict of infringement as to another claim, and a jury finding that the claims were valid. The jury awarded Striker $70 million in lost profits, further finding that Zimmer’s infringement was willful. In a post-trial order, the district judge awarded treble damages, found the case exceptional and awarded Stryker its attorneys’ fees. On appeal, the Federal Circuit affirmed as to infringement, validity and damages. Applying In re Seagate, however, it reversed as to willful infringement and the enhancement of damages. Based on that reversal, it also vacated the award of treble damages and attorneys’ fees. Styrker sought, and obtained, review by the Supreme Court in a case that was consolidated with Halo Electronics., Inc. v. Pulse Electronics., Inc. In Halo v. Pulse, the Supreme Court held that the the Federal Circuit’s two-part Seagate “test for determining when a district court may increase damages pursuant to § 284” was not consistent with § 284. Both Halo and Stryker were remanded to the Federal Circuit for further proceedings. Last month, the Federal Circuit issued its revised opinion in Halo. Today, the court released the revised Stryker opinion. Most of the new Stryker opinion involves a recitation of the Federal Circuit’s previous opinion affirming the district court as to infringement and validity. The last three pages, however, deal with the § 284 enhancement issue on remand. What’s interesting is that the Federal Circuit is maintaining its bifurcated approach to enhancement of damages, first requiring a predicate willfulness determination followed by the judge’s discretionary determination of whether and how much to enhance damages. This is essentially the same process as before. See i4i Ltd. Partnership v. Microsoft Corp., 598 F.3d 831 (2010). Pre-Halo, the second step of the process (the district judge’s determination of whether and how much to enhance damages) was a totality-of-the circumstances analysis that was reviewed for abuse of discretion (i.e. : basically the same as the court required in Halo). Id. The Federal Circuit’s post-Halo approach to enhancement involves the same two steps, with the exception that the willfulness determination itself is guided by the holding in Halo rather than requiring the two-element objective/subjective determination of Halo. (The enhancement determination is too, but it’s hard to see much difference there.) Under Halo, the subjective component alone can be enough to establish willfulness. Based on a similar rationale (although relying instead on Octane Fitness v. ICON), the Federal Circuit also remanded on the issue of attorney’s fees. Disclosure: I co-authored an amicus brief in support of neither party in Halo v. Pulse. When the Supreme Court’s October 2016 Term begins in a few weeks, its first patent hearing will be the design patent damages case of Samsung v. Apple. In Samsung, the Court asks: Where a design patent is applied to only a component of a product, should an award of infringer’s profits be limited to those profits attributable to the component? The statute at issue – 35 U.S.C. § 289 – indicates that, someone who (without license) “applies” the patented design (or colorable imitation thereof) to an article of manufacture, “shall be liable to the owner to the extent of his total profit.” Up to now, courts have repeatedly held that the “profits” are profits associated with the product (i.e., the article of manufacture) being sold, but Samsung is asking that the profits be limited only to components of the product closely associated with the patented design. Although Apple’s position is supported by both the text and history and is the approach easiest to calculate, I expect that many on the Court will be drawn to the potential unjust outcomes of that approach. Apple wins in a 4-4 split. Oral arguments are set for October 11, 2016. The court has granted certiorari in two other cases for this October 2016 term with briefing ongoing. In Life Tech v. Promega, the court again takes up the issue of exporting components of a patented invention and the extraterritorial application of US law. 35 U.S.C. § 271(f)(2). The question here is whether export of one component can legally constitute the “substantial portion of the components” required by statute for liability to attach. In the case, the component (Taq) is a commodity but is also an admitted critical aspect of the invention. In SCA Hygiene v. First Quality, the Court asks whether the equitable defense of laches applies in patent cases. The case is a follow-on to the Supreme Court’s 2014 holding in Petrella v. MGM that laches does not apply in copyright cases. In its decision, the Federal Circuit distinguished Petrella based both upon statutory and policy arguments. Oral arguments in SCA are set for November 1, 2016. The three pending petitions most likely to be granted certiorari are Impression Products (exhaustion); Amgen (BPCIA); and GlaxoSmithKline (antitrust reverse payments) However, these cases are awaiting views of the Solicitor General — which likely will not be filed until well after the presidential election. A substantial number of cases are set for the Supreme Court’s September 26 conference. These include the constitutional challenges to IPR coming in MCM and Carl Cooper as well as the interesting eligibility case of Genetic Tech v. Merial. It looks to be an interesting term. A skilled patent attorney working with a qualified searcher could cobble together a colorable obviousness argument against the vast majority of issued patent claims. Part of the difficulty for patentees stem from the the billions of prior art references available via increasingly effective search tools. Even when an invention results from a ‘flash of genius,’ patent law typically back-fills extensive knowledge for the obviousness analysis – even when that knowledge was not actually available at the time of the invention. The larger difficulty though is likely the large number of hard-to-pin-down facts such as the motivations, common sense, and level of creativity of a person having ordinary skill in the art. Throughout this Court’s engagement with the question of obviousness, our cases have set forth an expansive and flexible approach. . . . Rigid preventive rules that deny fact finders recourse to common sense… are neither necessary under our case law nor consistent with it. KSR v. Teleflex (2007) [04-1350]. Conventional wisdom post-1980 has been that the factual inquiry makes summary judgment of obviousness difficult for a patent challenger. Rather, obviousness goes to the jury. Since KSR, that attitude has shifted somewhat. (The even newer model is that obviousness goes to the PTO in an IPR proceeding – save that for a different essay). Summary Judgment of Obviousness: In DuPont v. MacDermid Printing (Fed. Cir. 2016) [15-1777], the NJ district court granted summary judgment of obviousness against the patentee DuPont – holding that the asserted claims of DuPont’s U.S. Patent 6,773,859 invalid under 35 U.S.C. 103. The ‘859 patent relates to the manufacture of a flexo plate for digital printing — a plate used to print digital images on flexible materials. The claimed advance involves heating-up the plate to remove unpolymerized material (rather than using a harsh solvent). The obviousness case combines two prior art references: “Martens [a 3M patent] teaches a process for developing an analog plate using heat” and “Fan [DuPont patent] teaches developing a digital plate using solvents.” The inventor (Roxy Fan) is also the first named inventor of DuPont’s ‘859 patent being challenged in this case. The Fan prior-art patent, however, was filed a decade prior. Reviewing these two references, the court found that the ‘859 patent uses “the same technology and processes pertaining to digital imaging” previously disclosed by Fan and the same thermal development process disclosed in Martens. In finding a motivation-to-combine these references, the district court walked through several factors. Limited set of potential combinations: The prior art only had two imaging styles (digital and analog) and four development techniques (thermal, etc.) – this makes the ‘859 combination more likely obvious to try. Market Incentive: DuPont marketing material suggest a “strong incentive” to combine the thermal process with digital plates. On appeal of this summary judgment finding, DuPont focused on the standard-of-review – noting that the district court had failed to “draw reasonable inferences” in its favor. In the process, DuPont pointed to a long list of factual disputes between the parties where it would be reasonable to draw different conclusions from the evidences. The Federal Circuit affirmed – finding that the strong undisputed evidence of prior art and motivation to combine fully supported the summary judgment finding. [T]he record contains strong evidence that a skilled artisan would have had a reason to combine two known technologies and would have had a reasonable expectation of success in doing so. Indeed, DuPont itself promoted the digital and thermal technologies as technological breakthroughs in prior art publications. Thus, in view of the record as a whole, even drawing all justifiable inferences in favor of DuPont, the objective evidence is insufficient to preclude summary judgment on the ultimate legal conclusion of obviousness. Doomed by Its Own Prior Statements: The obviousness case against DuPont here is interesting because (1) one of the core prior art references was a DuPont reference and (2) DuPont’s own statements regarding its prior inventions led to the motivation-to-combine finding. DuPont’s private case study will likely walk through and consider whether it should have taken a different pathway regarding the public disclosures. Caveat: Although the patentee’s pre-filing disclosures are important – it is also important to remember that the question of obviousness is an objective analysis focusing on the hypothetical mind of a person having ordinary skill in the art. What this means is that the patentee’s disclosures are should not be treated as “party admissions” and given special treatment in the obviousness analysis. Rather, the disclosures are simply added to the body of knowledge available to the artisan. Here, the Federal Circuit came dangerously close to crossing the line into giving information actually available to and created by DuPont special weight in the obviousness analysis. The USPTO is playing an important role in the National Cancer Moonshot, a Presidential initiative we blogged about earlier this summer, to speed up cancer advances, make more therapies available to more patients, and improve the ability to prevent cancer and detect it at an early stage. Today, we are launching the USPTO Cancer Moonshot Challenge to enlist the public’s help to leverage our intellectual property data, often an early indicator of meaningful research and development (R&D), and combine it with other economic and funding data (ie. U.S. Securities and Exchange Commission filings, Food and Drug Administration reporting, National Science Foundation grants vs. philanthropic investments, venture capital funding, etc.). This comes on the heels of our Patents 4 Patients program, which was launched in July and aims to cut in half the time it takes to review patent applications in cancer therapy. The USPTO Cancer Moonshot Challenge will conclude on September 12 and winners will be announced on September 26. Learn more about the prizes. Participants will have the opportunity to leverage USPTO Cancer Moonshot patent data to reveal new insights into investments around cancer therapy research and treatments. Some questions to address include: What are the peaks and valleys in the landscape of cancer treatment technologies? What new insights can be revealed by correlating R&D spending/funding to breakthrough technologies? What would trace studies of commercially successful treatments from patent to product tell us? With the data sets released through the USPTO Developer Hub, users will be able to use analytic tools, processes and complimentary data sets to build rich visualizations of intellectual property data, which will help illuminate trend lines for new treatments. During the three week challenge, the USPTO will hold a USPTO Cancer Moonshot Workshop to assist participants, on Thursday August 25. After the challenge has concluded, the USPTO, in tandem with other Moonshot Task Force partners, will look at further ways to use the findings. By bringing together cancer experts, policymakers, and data scientists, we can explore and identify how intellectual property data can be better leveraged and combined with other data sets to support cancer research and the development of new commercialized therapies. This will empower the federal government—as well as the medical, research, and data communities—to make more precise funding and policy decisions based on the commercialization lifecycle of the most promising treatments, and maximize U.S. competitiveness in cancer investments. We recognize that by enlisting the public’s assistance through our USPTO Cancer Moonshot Challenge, we can identify new and creative ways to fight cancer and work towards breakthroughs in treatment. And by harnessing the power of patent data, and accelerating the process for protecting the intellectual property undergirding cancer immunotherapy breakthroughs, the USPTO is standing up and doing its part to help bring potentially life-saving treatments to patients, faster. Are you up to the challenge?